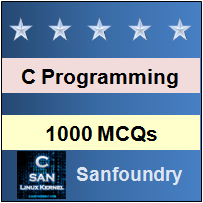 This set of C Multiple Choice Questions & Answers (MCQs) focuses on “DMA Functions, Memory Leak, Dangling Pointers – 1”. 1. What is the output of the following code if the input entered as first and second number is 5 and 6 respectively? 2. In the function malloc(), each byte of allocated space is initialized to zero. Explanation: In the function malloc(), allocated space is initialized to junk values. In calloc(), each byte of allocated space is initialized to zero. 3. Which of the following functions allocates multiple blocks of memory, each block of the same size? Explanation: malloc() allocates a single block of memory whereas calloc() allocates multiple blocks of memory, each block with the same size. Explanation: If we allocate memory dynamically in an function (malloc, calloc, realloc), the allocated memory will not be de-allocated automatically when the control comes out of the function. This allocated memory cannot be accessed and hence cannot be used. This unused inaccessible memory results in memory leak. In the above code, if the statement free(a) is removed, what happens? Explanation: The pointer ‘a’ points to the recent value 200, making the memory allocated earlier inaccessible. Hence, the memory where the value 100 is inaccessible and cannot be freed. Therefore, memory leak occurs. Explanation: There is no error in the above code. The format specifier being %s, address is not returned. Hence, welcome is the output. Explanation: The function realloc() changes the size a particular memory block. If the new size is larger than the old size, the added memory is not initialized. Explanation: The free() function frees the memory state pointed by a pointer and returns no value. Explanation: In the above code, the pointer p, points to a memory location which has been freed. Hece the above code is an example of dangling pointer.